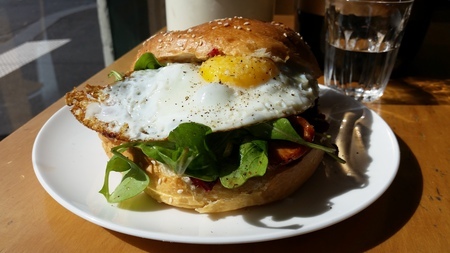 Whether you're recovering from a 'Hard Day's Night" or a hangover, or just lust over delicious homemade cakes, then Beatrix is the little cafe with the big Breakfast Burger for you. Layered with all the 'good stuff' you want in a big breakfast but without the pretentious fuss - think fried eggs sunny and runny, beetroot relish, spinach, avocado, bacon on a brioche bun with lashings of mayonnaise or maybe aioli. Jump on your bike and head down the hill to 688 Queensberry Street, and the corner of Lothian Street and secure your posse early in this tiny little gem. I dare you to walk away after breakfast without buying a cake, coffee or a rosewater meringue! Where: 688 Queensberry Street. North Melbourne.